It might not stay in your rig forever, but the G1Xon is a stellar introduction to effects. Broad range of decent effects sounds. Great value for money. High-gain tones aren't great. Not enough presets. While the G and MultiStomp series have kept Zoom at the cutting edge of multi-effects, the G1Xon's appearance recalls its former glories - in particular, the 707, which introduced a generation of guitarists to effects. 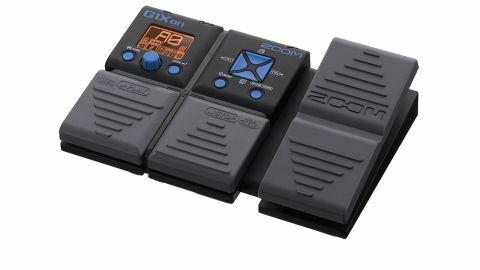 "The G1Xon sounds better than it looks, thanks to 80 of Zoom's latest-generation models"
The cost-effective plastic construction draws comparisons to the past, but the lil' LCD display boasts the pedal-based interface of Zoom's latest effects. It's easy to use: the cursor keys navigate through your five-strong effects chain, while settings are adjusted with the control knob. The two footswitches navigate up and down the 100 patches, and you can assign the expression pedal to any parameter you like. The G1Xon sounds better than it looks, thanks to 80 of Zoom's latest-generation models, including a wealth of modulations, reverbs and delays, plus a smattering of classic amp and drive models. No-one's going to mistake the high-gain sounds for the real thing, but it's easy to shape the amp models to your rig, thanks to a range of outputs, from headphones to a combo front-end; the 30-second looper and 68 rhythm patterns are perfect for messing around with, too. Although we were disappointed by the number of preset patches, the range of tones is staggering, including a decent pitch shifter, particle reverbs and a Seek Wah-style filter.